Liddell, a Bellwood native, achieved a bachelor’s in nursing from SIUE in 2014 after completing the SON’s regional baccalaureate nursing program at Southern Illinois University Carbondale (SIUC). The dual-enrollment program allows students to fulfill their undergraduate requirements and complete the SIUE nursing curriculum at SIUC. Liddell began his career in healthcare as a housekeeper, and progressively advanced to a certified nurse assistant and a unit secretary. His personal drive and passion for healthcare, supported by his academic foundation, have advanced his professional journey. He is currently pursuing a dual juris doctor and master of health administration at Saint Louis University. Additionally, he is a house supervisor at St. Alexius Hospital in St. Louis. For more information on the SIUE SON regional baccalaureate nursing program at SIUC, visit siue.edu/nursing. 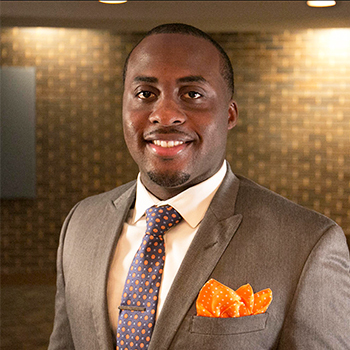 Photo: SIUE alumnus Kwamane Liddell, a member of the St. Louis Business Journal’s 30 Under 30 Class of 2017.